What is MERS and its relationship to Mortgages? 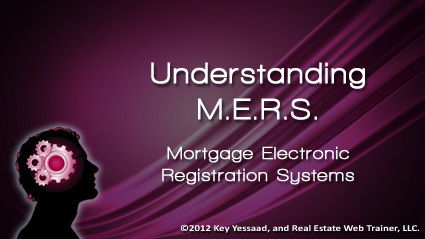 Understanding MERS – There was a time when mortgages were not complicated and easily understood; ‘a Mortgage is the charging of real estate property by a debtor to a creditor as security for a debt, on the condition that it shall be returned on payment of the debt within a certain period.’ Everyone knew the mortgagee and the mortgager. In the Nineties Banks got antsy and wanted to generated more loans but needed to clear their books first to raise funds and so was born MERS, the innocuous Mortgage Electronic Registration Systems. MERS is in essence a clearing house that packages loans into mortgage–backed bond securities that are then sold and transferred between investors. This has caused a grayness between the relationship between Mortgagees and Mortgagers; in others words who is the real debtor? Yesterday’s Court Ruling by The Washington State Supreme Court held that MERS’s business practices had the ‘capacity to deceive’ and it means that when banks used MERS to foreclose on a consumer, said consumer can actually sue for fraud. The heart of the problem was when banks put MERS’s name on the deed to facilitate transferring properties between entities and to speed up the process of recording deeds. Needless to say it is safe to ascertain that we have years of lawsuits and uncertainties in the Distress Property Market.